With one race of the 2017 season complete, we are perhaps a little further forward in figuring out what the rest of the year is going to offer up. Ferrari put on a decent challenge in Australia, taking the first victory of the year, so the season may not be about to go all Mercedes' way. Of course, one race doesn't tell us all we need to know, so it's about time we had another one - this time in China - to let us know whether our assumptions are correct. Sebastian Vettel claimed the first race win of 2017, with Ferrari and Mercedes doing battle in Melbourne. Red Bull didn't seem to be quite as on the pace as they'd hoped, but there's still plenty of time for them to join the fun. Meanwhile, Pascal Wehrlein missed out on the opening round, replaced by Antonio Giovinazzi at Sauber. That is going to happen again in China, with Pascal not even confident he will be back for Bahrain. Frustrated drivers hoping for better this weekend include Daniel Ricciardo (who retired from his home race in Melbourne), both the Haas drivers (the team qualified well but suffered a double DNF on Sunday), and Valtteri Bottas (who didn't do too badly but has a long way to go to trouble Hamilton within the Mercedes team). We'll also be keeping an eye out for how the racing unfolds, as there's plenty of consternation about the faster cars making it harder for drivers, but equally harder on overtaking. The weather forecast for the coming weekend suggests there's going to be a real challenge coming for the teams in terms of strategy. Friday is set to be wet, giving the drivers time to adapt to a wet setup and decide the balance of the car. However, Saturday is set to be dry with the rain returning on Sunday. The vast expanse of the Shanghai International Circuit is crumbling around the edges after almost fifteen years in the sport, and dwindling visitor numbers mean there is a disappointing lack of atmosphere. 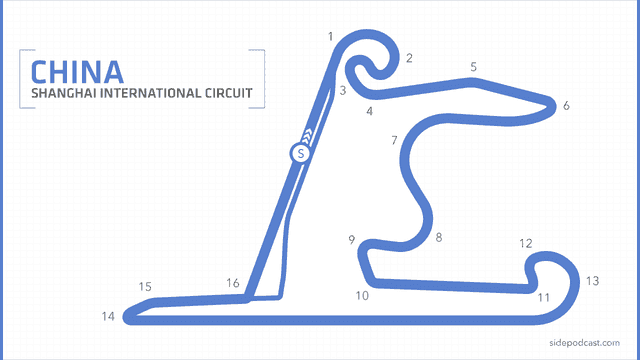 The track itself, however, makes up for that with some unique challenges, long straights and opportunities for chaos. A lap at Shanghai begins with the unforgiving first corner complex that leads drivers round to the right in an ever-tightening turn that then whips them back 180 degrees to the left. A couple of straights follow to complete the first sector, and then the winding middle section begins. After battling through some high speed corners, the speed drops to navigate turn twelve that leads drivers round and on to the hugely long back straight. Reaching 319km/h, drivers then have to hit the brakes hard to reduce for a second gear corner that leads to a short straight, a ninety degree left hander, and then back on the accelerator for the home straight. For the 2017 season, the track has had a spot of resurfacing across the start line to dampen bumps, and some extra padding has been added to the tyre barriers at turns one and eight. There are also new and higher kerbing areas around the track, so watch out for drivers struggling to miss those. Pole position is normally a key part of the race weekend, with eight of the 13 races run so far being won by the polesitter. However with the rain predicted sporadically through the weekend, pole may not be all its cracked up to be. Hamilton has enjoyed good qualifying results in China with five pole positions, followed by Vettel who has three. Meanwhile, starting lower down the grid is usually quite a hindrance, with Mark Webber's podium finish in 2011 from 18th the only occasion a driver has picked up a trophy from outside the top ten on the grid. The changeable conditions will affect the tyres hugely - we may even see an early appearance from the green or blue wet tyres during the weekend. Otherwise, it is the medium, soft and supersoft compounds available for drivers this weekend. New Pirelli boss Mario Isola says: "We expect teams to use mainly soft and supersoft, depending of course on the unpredictable weather: especially as the allocation is just two sets of medium. In the past, there has been some graining in China due to the long straights followed by tight corners, but we've seen in Barcelona testing that graining is generally reduced this year, so it will be good to have that confirmed."